Prague is considered one of the most beautiful cities in all of Europe, and rightly so. This classic Bohemian city has everything from castles to cobblestone streets, lantern-lit passageways, and an intriguing history tying them all together. There’s so much to be done in this medieval city to keep you busy for days, but if you’re short in time or need to be selective on what to do, here are five things you must not miss while in Prague. Prague’s Orloj, or the Astronomical Clock, is one of the most beautifully designed clocks still in use today. The clock, which was built in 1410, is situated on the southern wall of the Old Town City Hall and is considered to be like a medieval planetarium, displaying the current state of the universe with extreme accuracy. The clock is a complex yet stunning mechanism that contains an astronomical dial (showing the position of the sun and moon, the zodiacal ring, the old Czech time scale to indicate the time of sunset, and other astronomical details), a calendar with medallions (representing the months), and The Walk of the Apostles (showing figures of the apostles at the hour, every hour, as well as the figure of death represented as a skeleton). Crowds gather in front of the clock every hour to witness the mechanical show the clock has displayed since the 17th century - specifically The Walk of the Apostles. Throughout its history, the clock has suffered its moments of malfunction and disrepair, but it is still considered the third oldest astronomical clock in the world and the oldest still working. 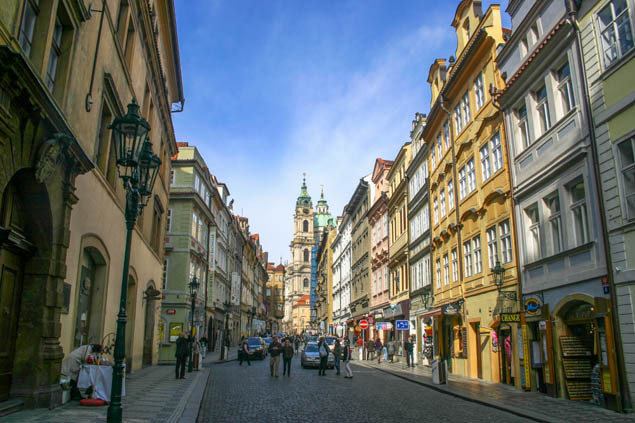 While you’re here, walk around the Old Town Square, Praha-Staré Město, and its surrounding streets – all lined with medieval buildings dating back to the 10th century; including the Old Town Hall itself. If you head over to the Jewish Quarter of the Old Town, you’ll be able to visit the Old Jewish Cemetery, which was used from the early 15th century until 1787. Visually, this cemetery looks more like a gravestone quarry than a proper cemetery, due to the closeness and density of gravestones found all over its grounds. These markers are placed so close together, that you don’t know where one grave ends and where the other begins. Due to the several layers of tombs this cemetery contains, the number of gravestones and people buried here is uncertain. However, it has been estimated that there are approximately 12,000 tombstones presently visible and there may be as many as 100,000 burials in all. This is an astounding number considering the size of this cemetery. Almost every street in Prague is full of intriguing history, so it’s no surprise its bridges are no exception. Take a walk along Karluv Most, also known as Charles Bridge, which is the oldest bridge in Prague, dating from 1357. Since this used to be the only bridge crossing the Vltava River until 1841, it is still to this day considered the most important connection between the Old Town, Prague Castle, and its adjacent areas. The bridge contains a series of saint sculptures that not only serve as decoration but also play a strong role in Prague’s religious culture. Many of the bronze sculptures already gleam in certain spots after being rubbed by many for good luck or out of religious respect. After crossing the bridge, head up to Prague Castle, the largest castle complex in the world and a UNESCO World Heritage Site. The Prague Castle deserves at least half a day if you want to explore it properly, but if time is short, at least give it a couple hours. The castle’s complex houses religious buildings, palaces, gardens, museums, and defensive towers. Since its construction in the 9th century, the castle served as the home to the country’s rulers, a tradition that lasted for more than a 1,000 years. Today, it is home to the office of the president. Head to the gates of the castle at the hour, as every hour there is the changing of the guards ceremony. Spend some time wandering around the well-manicured gardens before you explore the Gothic St. Vitus Cathedral and the Golden Lane; a network of small, colorful houses that originally housed the palace guards. Today these houses are all shops and cafes. If you’re looking for a snack, try the traditional yet unusual-looking Czech pastry called Trdlo – which means “Crazy.” It is a dough, wrapped around a steel rolling pin, baked over open flames, and then rolled in sugar, vanilla, crushed almonds, and cinnamon. It is very sweet and really delicious! You can find this snack all over the old town, and old square. Take a few pictures of the baking process too, as they do it in the open for everyone to see. Use our app to check medicine names abroad, get embassy info, find security alerts and more!